One item that I find myself coaching over and over involves the concept of breathing, along with how to approach it for various exercises. Whether or not this biases me as “the breathing guy” at my facility doesn’t matter to me – if I can use and manipulate my breathing to do the task at hand, I’ll do it. Essentially the way you approach how you breathe for a 1RM deadlift will be very different than the way you approach breathing for a 2 mile run. 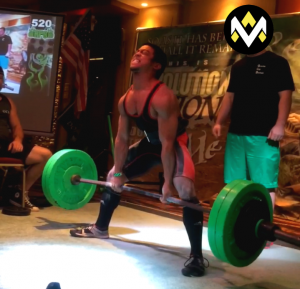 Fun Question – Do you think I got this lift, or missed it? This necessity for owning your breathing patterns becomes even more readily apparent as you begin to understand the differences that the two different tasks will ask of the body. As far as I know, the mentality of controlling breathing to improve the outcomes of exercises or a physiological output is not new. The common denominator is the air we breathe, and the differences begin with how we manipulate this air within our body for whatever the task may be. While for some individuals it is understood that the way you breathe during a really long set versus improving the tonic/phasic relationship of your muscles will be different, the way you approach the breathing component on each example is very subtle. Done properly, and you can get a lot out of it. Sensory awareness of what occurs in your body has several research articles speaking about any individual’s ability to focus internally. With this in mind, the focus for breathing with an inward attentional focus is meant to improve sensory awareness of one’s body in space, along with understanding what muscles may be being “kicked on” in order to maintain a certain postural stance or sway. Pay attention to these guys sometimes. Aaron Swanson had a great internal cueing article on what the benefits are for understanding what occurs from an internal point of view, and this is a point that I made during my most recent presentation at the Cressey Sports Performance Fall Seminar – it will be difficult to teach a complex movement (bracing for a depth jump to a broad jump and landing on one leg) if you don’t understand some of the simpler moving parts in your body. Static exercises have the grouping of planks, side planks, any exercise in which you are static (staying still) and require a constant stream of inhalations and exhalations without any extraneous pressure from the musculature that is statically being challenged. Isometric Holds – Bottom of Squat, Push-Up, Lunge, etc. Isolated Exercises to Improve Motor Control – Rotator Cuff exercises, hip exercises, etc. So while the joint and thusly the muscular position may be necessary to understand and feel, this position will need to be reinforced further when looking to load or hold for a certain amount of time. 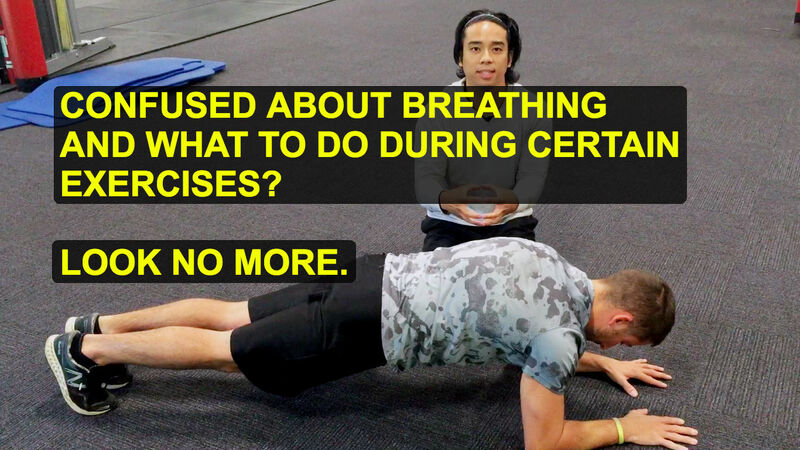 More specifically, for a lot of our athletes, clients, and even my online clients, I may utilize breaths, as in cycles of inhalation and exhalation, to regulate the duration of a specific exercise (instead of an arbitrary time such as 15, 20, or 30 seconds). In the video, I describe how to troubleshoot your breathing patterns in both supine and during an active movement such as the squat. 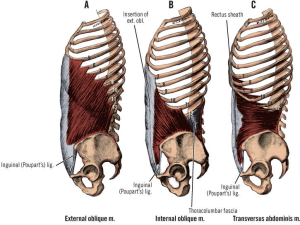 If you have 400 or 500lbs (or more…) on your back for a back squat, there is certainly a need to maintain great amounts of intra-abdominal pressure through tensioning techniques through the musculature, along with reinforcing this tension with a gaseous form of stability – air through the diaphragm and/or pelvic floor (and closing of the epiglottis aka your throat, because that is how we prevent air from escaping). When describing how to “hold your breathe,” I am not merely describing how to pass out as fast as possible. Hopefully, and with a little more background into the individual who is performing said technique, I am teaching lessons towards improving stability for spinal segments up and down the chain. Note/Disclaimer: I’ve also had an older population of clientele that will be unable to perform the Valsalva maneuver due to greater increases in blood pressure that does not need to be risked due to heart conditions. Please note that I am not telling you to do the Valsalva maneuver as a way to complete heavier lifts – it is merely a method that *can* be used, it does not *have* to be used. Locomotion can refer to moving in whatever fashion you want – dancing, sprinting, and/or jumping. This is a combination of the previous approach for breathing, because the way you move for a Forward Walking Lunge may differ than a one mile run. With this in mind, imagine how holding your breath during the first meters in a sprint will affect the outcome of the whole movement. This is opposed to slightly intra-abdominal pressure as you take a forward step during a DB Walking Lunge. Different exercises, different goals, and different approaches. Generally speaking, if it is an exercise in which you have a consistent and regular movement pattern – swimming, running, rowing, or anything generally that lasts longer than 60 seconds, you will need to approach your breathing a little differently. If you will be performing an exercise that lasts under 60 seconds (or more), but still has load in your hands or on your back, bracing for intra-abdominal pressure while still gaining new air during your movement for spinal stability will be especially useful. 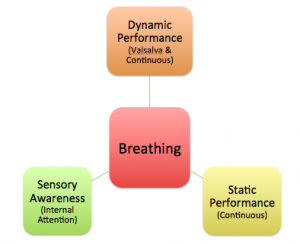 While this topic of breathing is certainly nuanced, I am merely describing one more method of how to improve performance within the context of breathing.